Combine salt, vinegar and shallot. Set aside and allow to marinate for ten minutes. Slice cucumber. Season with pepper. Drizzle with dressing when ready. Sprinkle with microgreens if desired. Serve cold. Hello--I love this salad. You are right, the different shapes make it new and fresh. I would like to try champagne vinegar--what an idea! I also recently made a spicy cucumber salad which was an eye opener; such a different taste for a somewhat innocuous vegetable. Great photo - sounds & looks delicious! I swear, you can make the most mundane things look pretty and delicious. The photo looks beautiful. 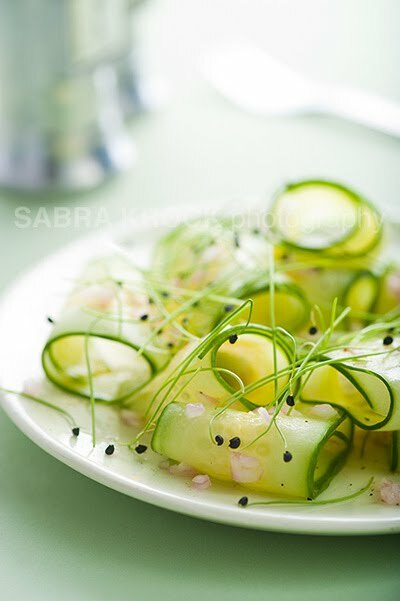 Cucumber salad is an all time refreshing salad! Yumm..
As fresh as fresh goes that's for sure! Looks fantastic! Are these onion chives on top? I am growing some in my garden and we use them all the time to top fresh salads. Wow I love cucumber with vinegar... it's tasty! I love your photo of it and it makes this simple dish very elegant! This salad is too beautiful to eat! :) I love any cucumber and this one looks super fresh. I've never tried champagne vinegar. This looks very refreshing and is beautifully styled! Never thought I could cut cucumber like that. That's a nice plate for the dish. I want this peeler. Usually cucumbers are boring to me. But not this salad. It's so artistic. That's it! I'm buying myself an extra wide peeler.